Produced by GLOBE VIDEO FILMS and released March 2002. 'Western Renaissance' features two very distinct 'WESTERN' eras. Most of the programme features recently unearthed and previously unpublished cine film of the 'Westerns' in the period 1973-1977. This footage was filmed primarily by two enthusiasts chasing the class in the West Country but other locations such as Bristol, Swindon, Reading & Paddington appear together with views of the specials operated in their final months. Included is unique footage taken from right behind the locomotive on travels throughout the West Country. Ride behind 'Western Glory' over Brunels' famous bridge into Cornwall; with 'Trooper' on the Newquay branch; with 'Duke' over the Devon banks and 'Sentinel' along the Dawlish coastline. 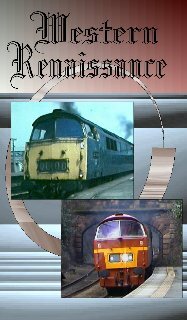 The final part of the program features the rebirth of the Class on the mainline starting with he test run of Western Champion at the end of January 2002 and finishing with epic views of the locomotive on it's first proper train in February of that year.